Once upon a time dog sledding was a common mode of rural overland travel and transporting goods among the colder regions of North America from upper Midwest states and New England throughout Canada and into Alaska. Now those regions feature races among dog sled teams. Dog team sleds are handled by one person, known as a musher. Dog sledding races range from “sprints” of 12 miles to the grueling 1,000 mile Alaskan Iditarod Trail Sled Dog Race. These long distance dogs need an easy to digest high density nutrient food supplement to assist their needs. 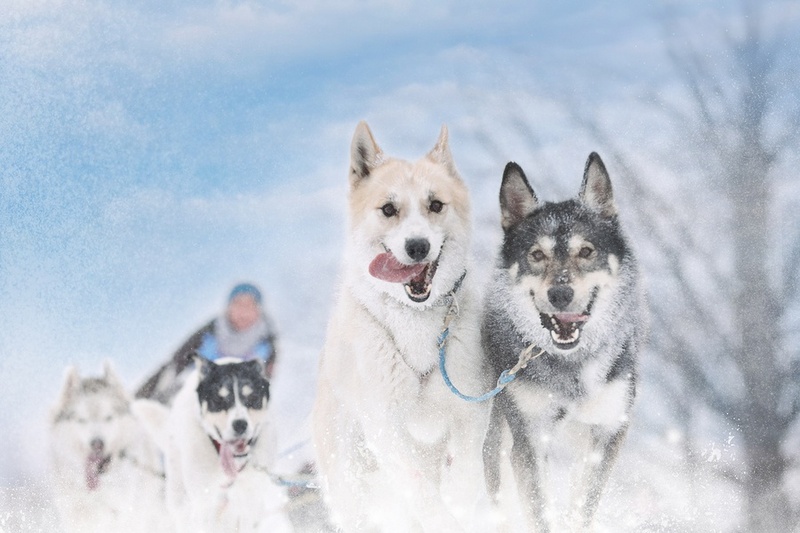 Jim Blair, an ethical musher, mushing teacher, and owner of Eden Mountain Lodge in Vermont, feeds his dogs a tablespoon of coconut oil daily and has noticed great results in their performance and overall health! One of Jim's concerns for his dogs was their paws. Pulling a heavy sled at running speeds with other dogs in the snow and ice is hard on their paws. Their paws collect ice and get skinned up, becoming too tender to run on as well as leading to potential infections. Jim became dissatisfied with using zinc oxide salves externally on the dogs’ paws. Dogs licking zinc oxide creams off their paws can harm them and they would become ill. He also thought it would be better if their paws didn’t become skinned up and inflamed in the first place. Jim found that using coconut oil internally with his dogs solved that external problem. Jim is now spreading the news of how coconut oil improves dogs’ stamina running through snow and ice while also protecting their paws from painful inflammation. Jim’s ethically run dog sledding teams have been winning dog sledding races in Quebec’s Sled Dog Club competitions recently, and he’s spreading the word to other sled dog owners and mushers about coconut oil.